I first became aware of Digable's existence by reading a message written in chalk on the pavement of Church Street: "DIGABLE CAFE - GREAT COFFEE THIS WAY" (with a couple of arrows pointing helpfully down a side street). Maybe it was because the chalk message reminded me of so many I used to see in my uni days (eg "LSS BBQ 1PM TODAY - SOUTH LAWN"), but I was instantly charmed by the resourcefulness of Digable's advertising. 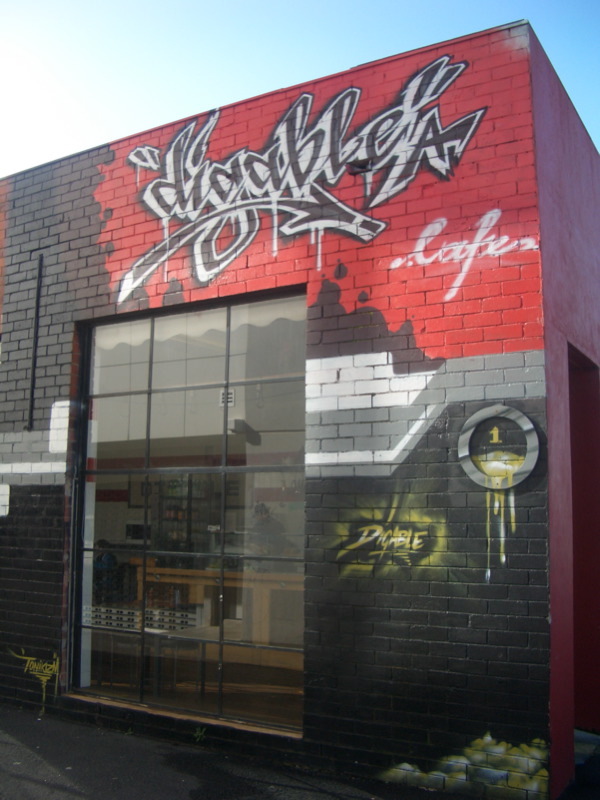 Digable is the only cafe I can think of off the top of my head whose website is a MySpace page (with some catchy beats playing on it). It made a bit more sense when I learned that the cafe is operated by local DJs and musos who promise to "ensure the music selections are of top quality, bringing you the best in Soul, Dub, Hip Hop, Funk, Jazz, Blues and world music to enhance your dinning [sic] experience". The facade of the cafe is adorned with street art and the changing breakfast and lunch menu features organic free range green eggs and fair trade organic Coffee Supreme. I worried the people running it may turn out to be slightly wanky, but the girl who served us was completely unpretentious and rather sweet and chatty, and the food was great when DJ and I went for a housemate brunch a few Saturdays ago. 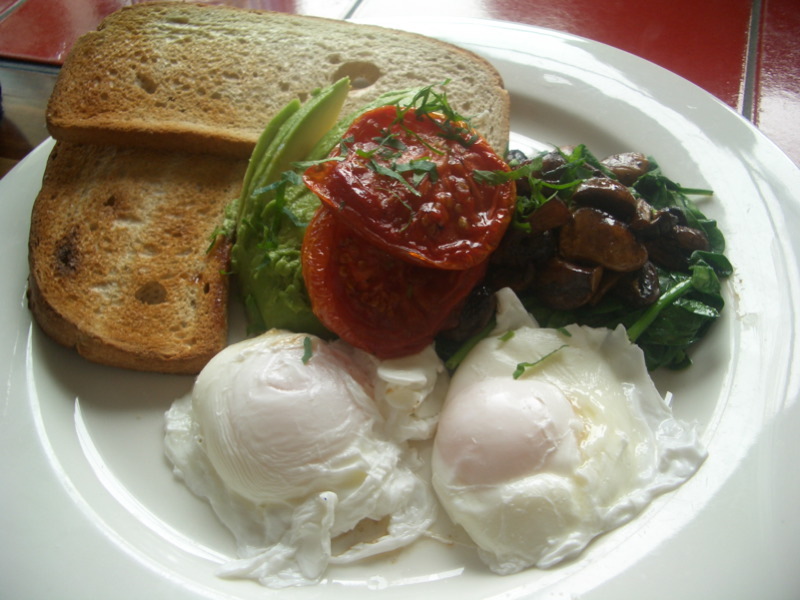 I ordered the Vege Eggs - soft-poached with avocado, mushrooms, slow roasted tomatoes and spinach ($12.50). The dish was a simple one and done well - the mushrooms had a slight tartness to them that I liked. 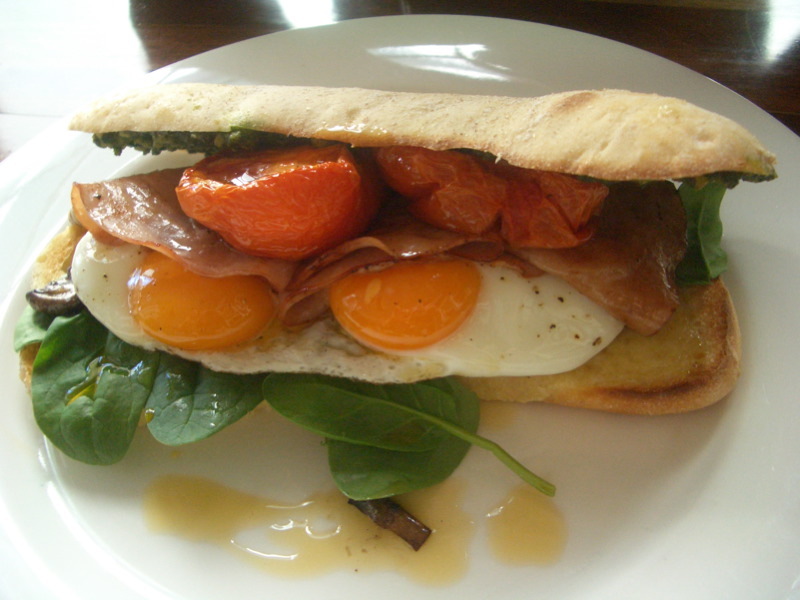 DJ ordered the Brekky Sanga - toasted ciabatta with two fried eggs, ham, tomato, pesto, cheese and spinach ($12). I think I would've toasted the ciabatta slightly more and maybe wilted the spinach a little, but DJ was very happy with it. 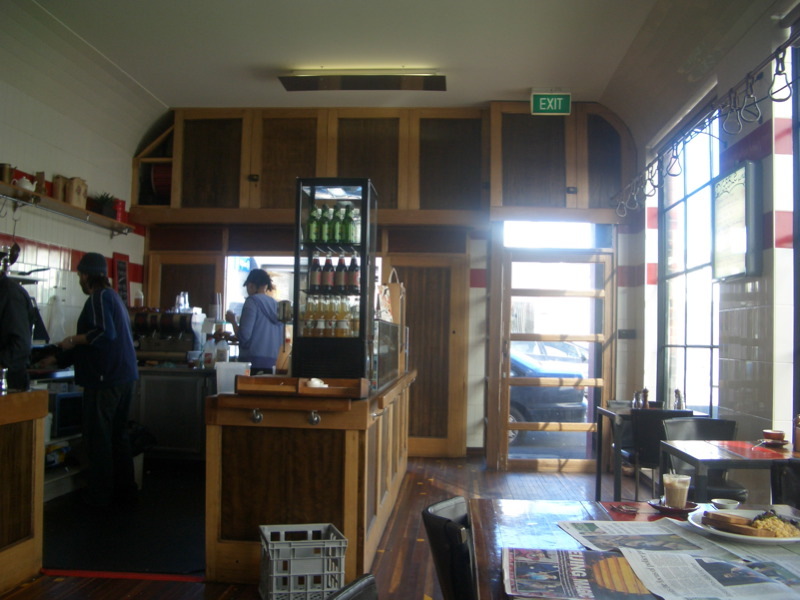 i went here years ago, i think it was called caboose then or something of the like. considering they use an amzing coffee supplier, SUPREME, the coffee was very ordinary..
Hey anonymous, sorry to hear your coffee years ago when it was called caboose was average. The ones we had the other week at Digable were great. Hiya dani, yeah it was a pretty nifty sanga! 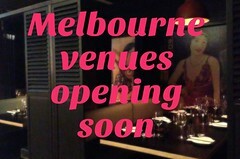 Worth checking out next time you're in the 'hood. 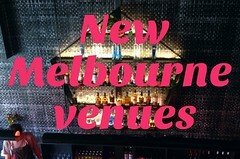 Try Portello Rosso, a new place in Warburton Lane (very near Sette Bello). It is underneath (and owned by the same people as) Murmur and it styles itself as a pizzeria and jamon bar. I am not going to "write it up" for you, as I did La Vita Buona a few weeks ago because your are likely to do it more justice. Suffice to say that I think it's excellent. Sorry about getting your name wrong. I just had lunch with a "Clare". Thanks Andrew, I'll bear it in mind. I like Murmur a lot. Portello Rosso sounds like a great potential entry for the King / Bourke Quest! Oh that vege brekkie looks soo good! I think I might go there tomorrow!